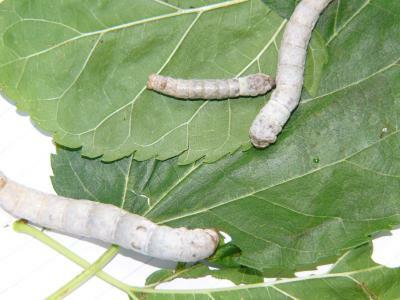 These are the three silkworms that I am looking after. Their names are Bella, Liddy and Grace. My baby's name is Grace. My baby does not look well. She lies so still and she does not want to eat a leaf, so I am going to put my baby back into the big box where heaps of silkworms are, and I will get a new baby silkworm. My big silkworm is Bella. I think she is going to spin her cocoon soon because when I have held her, she had some silk coming from her body. I have never seen a silk worm. Their kind of ugly yet at the same time kind of interesting. I can see why you would be fascinated by them.